The dead men were identified as David Charles and Kurt “Ratty” Smith, 28. According to a police report, at about 8.35 am, Charles, who was driving an Almera vehicle, pulled off the road after he heard a siren coming from a white Hyundai Tucson SUV behind him. The vehicle also had a flashing blue light on the dashboard, an eyewitness said. Police were told that seconds after Charles pulled off the road, the SUV stopped behind and two men dressed in khaki outfits and ski masks, and what appeared to be bullet-proof vests, alighted the vehicle and approached Charles and dragged him out. Police said the men attempted to push Charles into the vehicle, however, he attempted to fight them off. A third man emerged from the SUV and the men held Charles down before he was shot repeatedly, according to CCTV footage of the incident. The men got back into the vehicle and reversed over Charles’ body before speeding off. As the SUV sped off, Smith, who was standing on the corner of Riverside Road, was also shot several times by the occupants of the SUV. Smith was taken to the St James Infirmary by residents, however, he died while undergoing treatment. Both Charles and Smith lived at La Puerta. Smith’s older brother, Curtis “Birdman” Smith was gunned down at La Puerta almost a year ago, on August 21, 2017. Residents in the area, who spoke on the condition of anonymity for fear of their own lives, said that they believe there is a “pact” to kill every member of Smith’s family and Birdman’s close friends and associates. One of the men who was killed at the Boardwalk in Chaguaramas on July 9, Fabien “Super” Williams, was said to be a close friend of Charles. Williams, who lived at Sea View Hill, Carenage, was killed along with two others – Kedel “Timeless” Osbourne, 21, also from Sea View Hill and Andrew Francis, 39, of Mamoral No. 2. Guardian Media was told that Charles was scheduled to appear before a Port-of-Spain magistrate yesterday on charges of arms and ammunition. A resident of La Puerta said that since Birdman’s killing, they believe there was a hit list out for members of his family and close associates. A relative of Smith refuted reports that the Smith brothers were involved in gang activity. “Ratty was never involved in any gang and guns and stuff…he was a contractor and he worked hard for his money. He was always ready to help anyone in need and was very kind-hearted,” he said, on the condition of anonymity. A senior police officer at the Western Division said investigators are reviewing the CCTV footage of the incident, which also went viral on social media and could not confirm whether or not the gunmen were police or men pretending to be police. 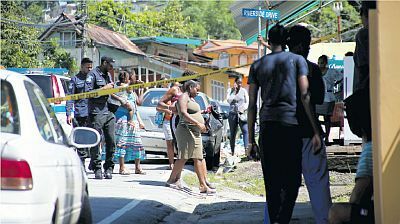 Acting Commissioner of Police Stephen Williams, when asked about criminal elements using vehicles resembling official police vehicles accompanied by flashing blue lights and sirens, said: “I would not want to comment loosely at the moment...when I am in a better position to comment I will.” This latest double murder brings the murder toll to 340.